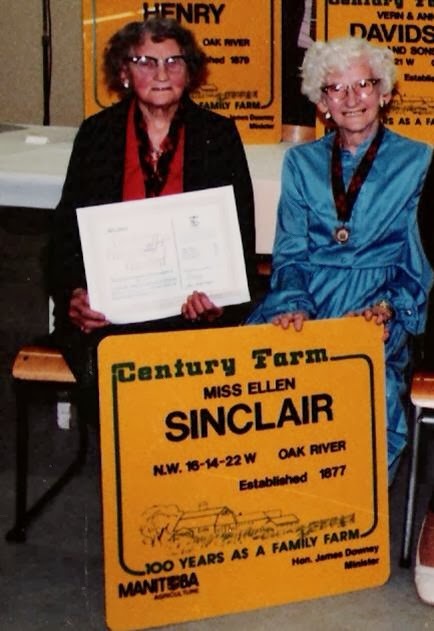 Ellen Sinclair was born and lived her entire life of over ninety-three years on the Sinclair farm. She was the third child of James and Elizabeth and although her two older sisters had middle names, I can't find any record of her being given one. 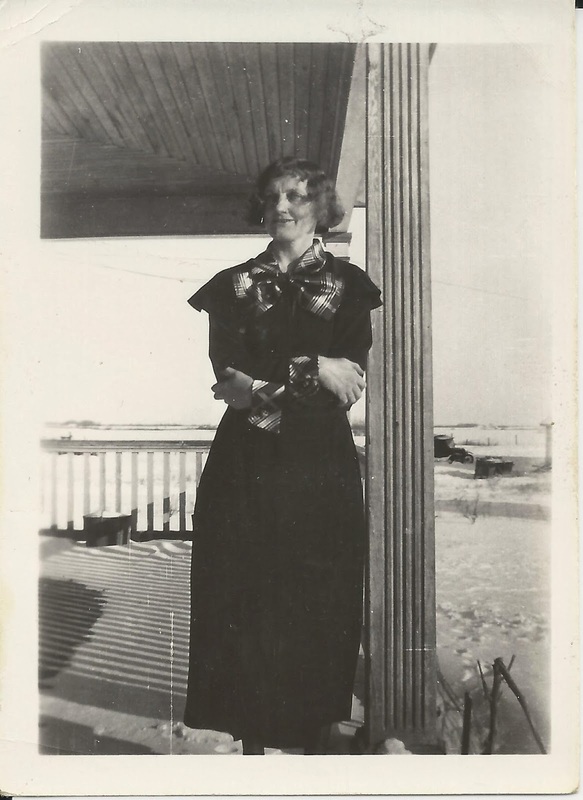 She was most often known as Nellie but also as Aunt Nannie to her nine nieces and nephews and many great nieces and nephews, like me. 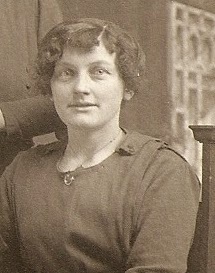 She was a younger sister to my grandmother, Mary Simms. 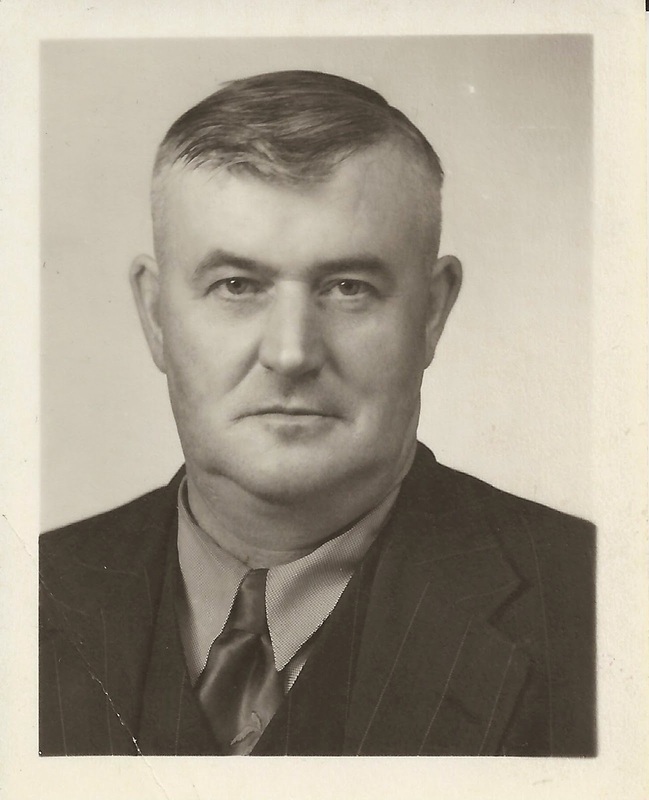 Her father James Sinclair was featured in Week 4 of this blog and her mother Elizabeth Henry was in Week 7. 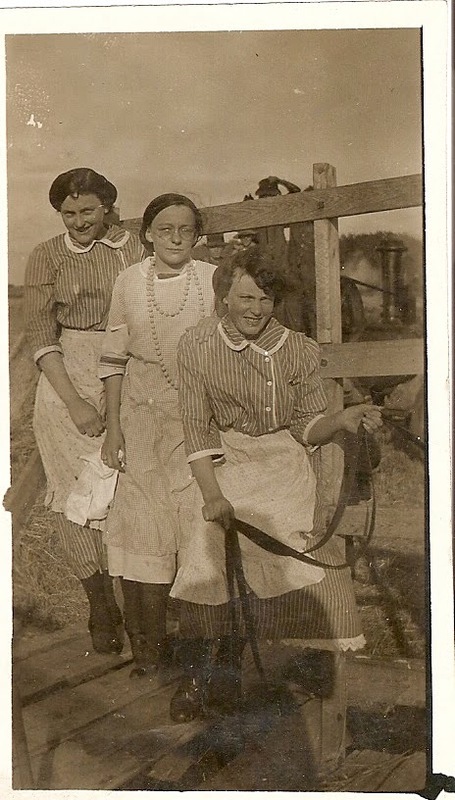 The photo on the left seems to have the three of the Sinclair sisters hard at work on the farm, I'm guessing in the 1910's. 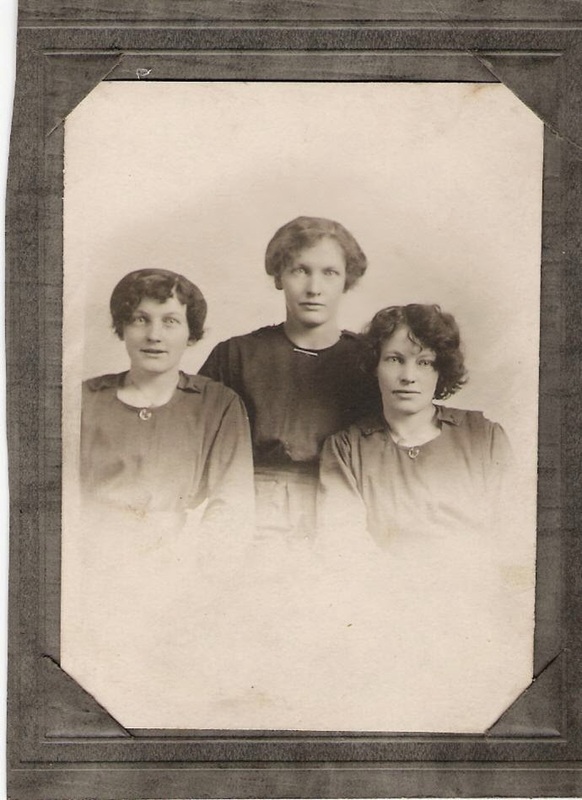 Nellie is on the left, Lizzie in the middle, and Jean at the front. Jean was one year older than her and Lizzie 3 years younger. The studio portrait on the right is Nellie, my grandmother Mary in the back and Jean on the right maybe in the 1920's. 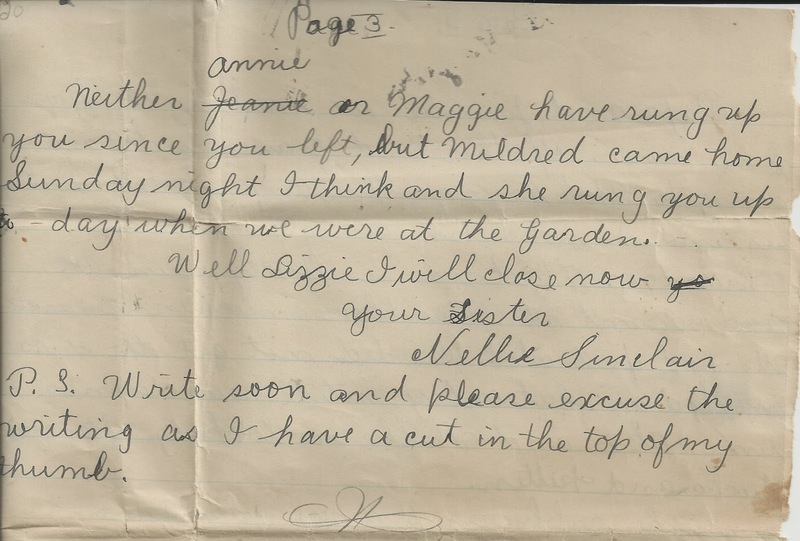 The following letter was written by 15 year old Nellie to her sister Lizzie in 1910. She announced that she had passed "entrance" and the departmentals certificate and the envelope it came in is farther down in this post. I think she took all of her schooling at Bankburn School near their farm. 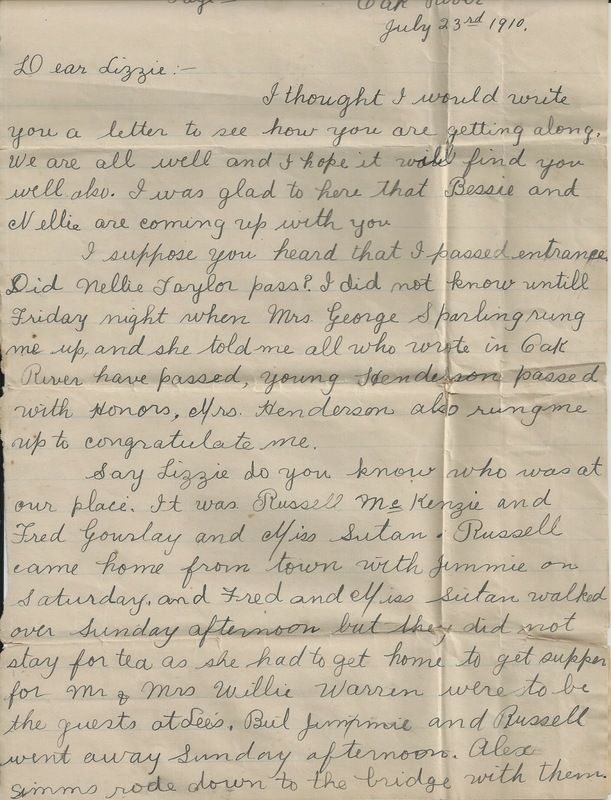 It is of interest to note that she referred to her parents as Mother and Papa and that they had a telephone that they used frequently, it seems. 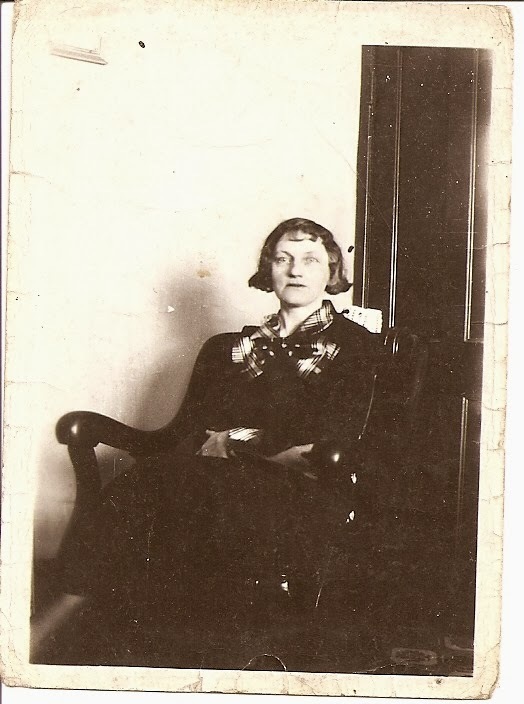 Aunt Nellie was a "spinster" ans she is always who I think of when I hear that word! 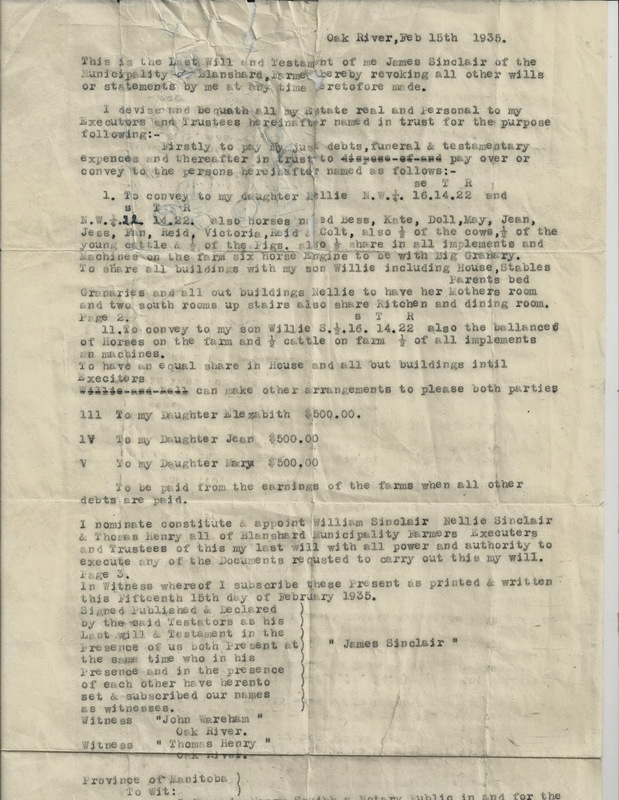 She never married but had her place in operating Bankburn Farm as is clear in her father's will pictured below from 1935. She had a love for children and we were always welcomed and made to feel special in her home. She never forgot our birthdays and there were always gifts from her at Christmas - slippers, pajamas, and purses that I rmember clearly! New Years Day was a big event in the Sinclair house and "Come for tea" was written on every card she sent me. I have her last diary from 1986 and 1987 that was a daily weather log as well as a place for keeping track of the visitors that came for morning, afternoon, or evening lunch as well as detailing where anyone who left the farm went. 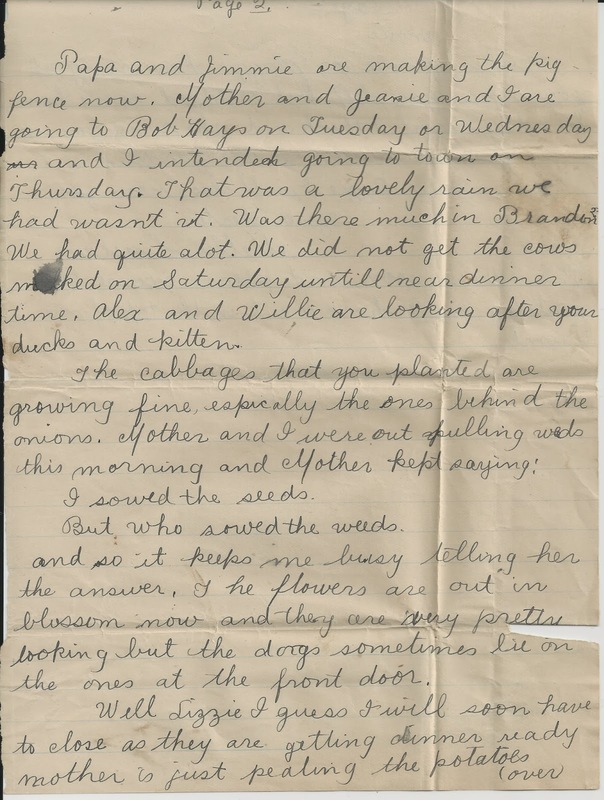 One time while Aunt Nellie and Uncle Bill were working in their garden, I was with them and began eating peas. I was told I would be sick if I didn’t soon quit. Well, during the night the peas decided to be upchucked. As I messed up one bed, we found another and finally after going to the third, I was relieved and ready to sleep. How Aunt Nellie put up with it, I don’t know. I heard her telling Grandma the next morning, but she took it all in her stride. Never once in all our times there did Aunt Nellie, Grandma or Grandpa ever scold us. Now I know how she felt about us. I am and was the same with my nieces (& nephews). They were the light of my life. 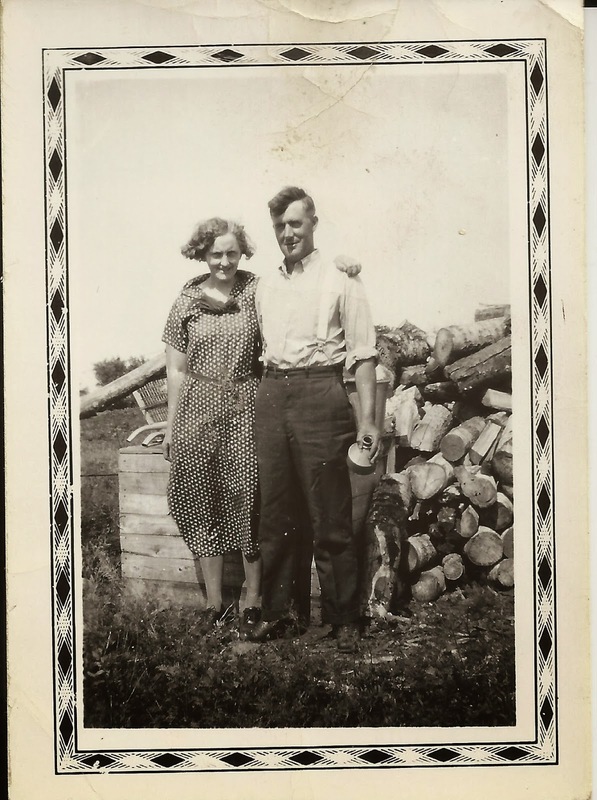 The photo above on the left is of Aunt Nellie and Henry (better known as Harry) Clyne at the woodpile. 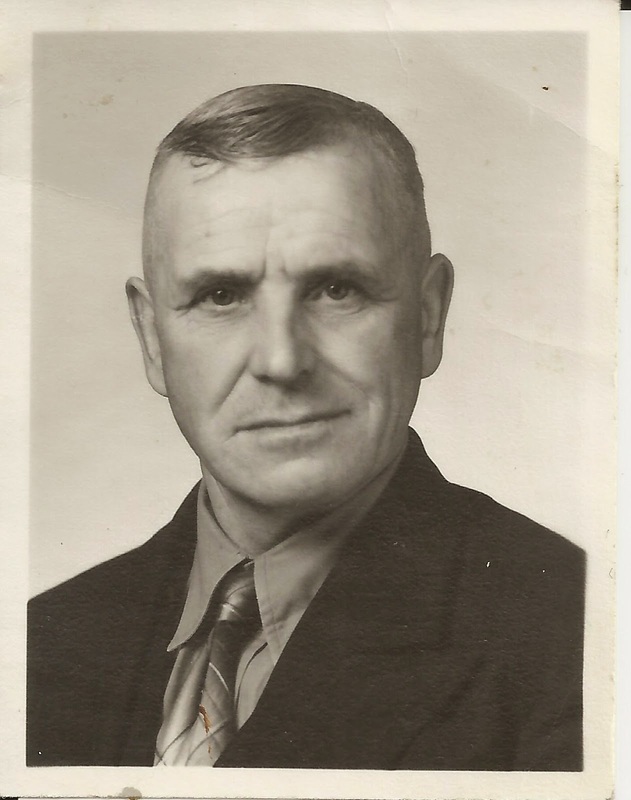 He was a long time hired man at the Sinclair farm along with John Paul who was known as Scotty. They were treated like family as neither man was married nor had any close family of their own in Canada . Nellie corresponded with their families in the Old Country, as she called it, in Scotland. These men were the drivers in the household after Uncle Bill died in 1972 and Dad remembers how both ladies would pile in beside Scotty or Harry to head to town and no one ever sat in the back seat! Scotty died in 1988 and Harry in 1989, both in their late 80's. 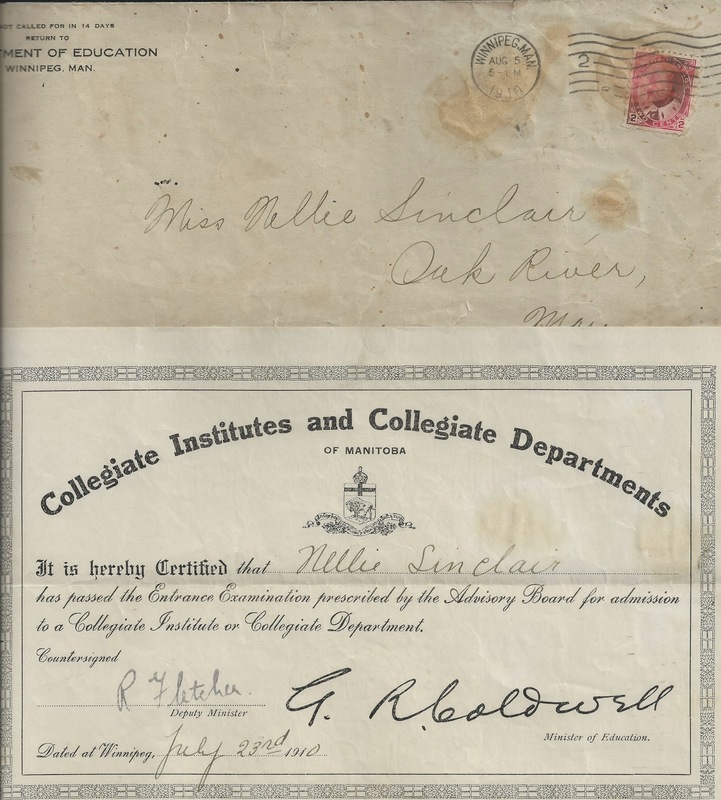 Nellie was involved in community work with the Oak River Agricultural Society and with her brother Bill and sister in law Jessie, organized and worked at the food booth at the Oak River Fair and Sports Days for many years. Sandwiches, hot dogs, and homemade pie were on the menu. She was also an active member of the Busy Bee Red Cross group chaired by her sister Lizzie during WW2. They made quilts and packed parcels for the boys overseas. The 1970 Blanshard History book says a typical parcel included socks, chocolate bars, gum, fruit cake, cookies, sardines, potted meat, cheese, hankies, noodle soup, and chocolate drinks. I remember that she quilted and likely sewed her own housedresses and aprons too. 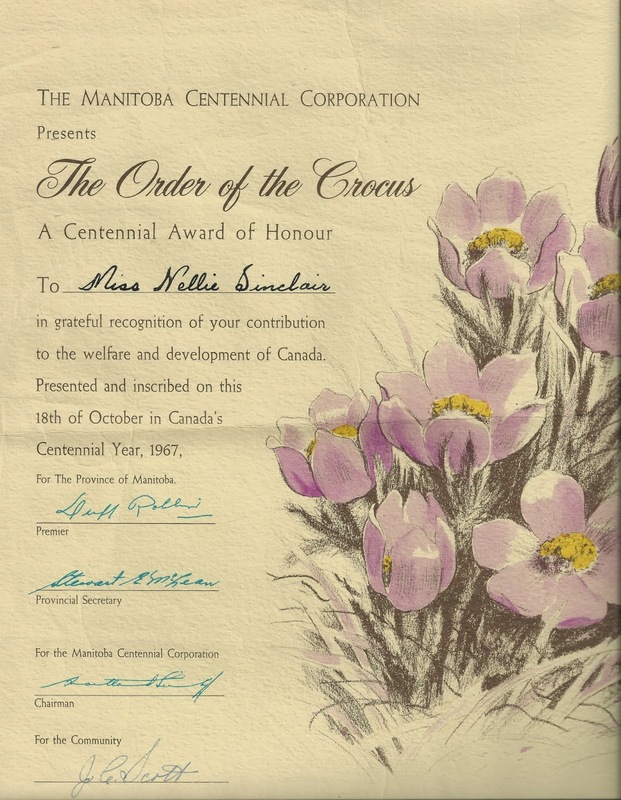 The Order of the Crocus, pictured above, was given to Nellie in 1967 along with 499 othes as selected Manitoba citizen over the age of 75. It was signed by Premier Duff Roblin and other dignitaries of the day. 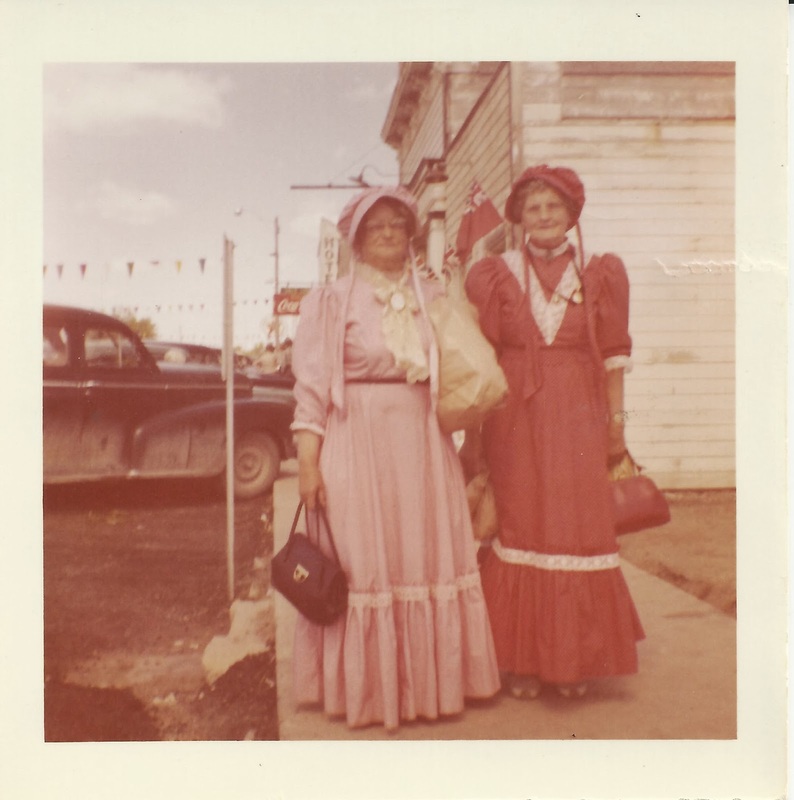 In the photo above, Aunt Nellie is in the red dress and her sister, Lizzie Morcom is in the pink. This photo was likely taken for Centennial in 1967 or perhaps 1970 on Main Street in Oak River. She was instrumental in preserving history of the early days of Blanshard Municipality with her contributions to history books for Blanshard and White Bank Lea community and the ceremony for the cairn at Bankburn School. In 1987, the Sinclair farm was recognized as a Century Farm, having been owned by the same family for over 100 years. Aunt Nannie is on the left in this picture and beside her is her sister in law and constant companion, Jessie Henry Sinclair. My dad continues to own a quarter of the original farm which now puts family ownership at 137 years. I remember Aunt Nannie talking so fast, I often had to get her to say it again. As the years went on, she became hard of hearing but the kettle was always on for a cup of tea and lunch. I remember her lemon custard tarts and shortbread with the coloured sprinkles cut into triangles that melted in your mouth. The hired men, Scotty and Harry would sit in the porch smoking their pipes until it was time for tea at the kitchen table. Her bedroom was a wonderful place for us cousins to play on the coats that had been piled there while we visited for New Year's Day. She had toys on the top of the door frame casing and I can still picture a monkey that played the drums up there until she would pass it down! Aunt Nannie died in 1988 and is buried in White Bank Lea Cemetery where she spent many hours tending the peonies and planting flowers for her own ancestors. 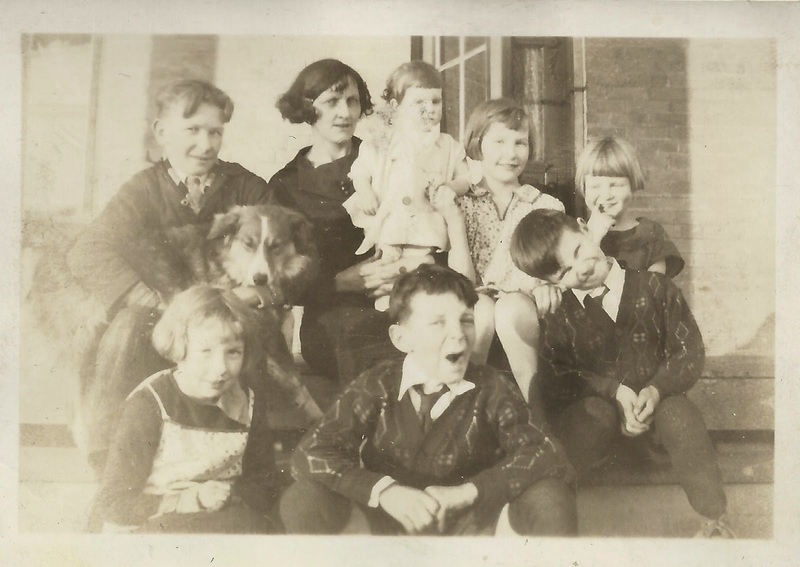 Cousins and friends, please add your own memories of Aunt Nannie in the comments. She was a special lady that touched many lives. Thank you for sharing this well-written story of your aunt. How fortunate you are to have strong women in your family history! It seems she had a full life.